Enerquip provide technical phone support Australia-wide and 24/7 technical assistance to local regions. Spare parts and equipment can be supplied for both local and remote locations anywhere within Australasia. Enerquip’s 24/7 service area encompasses South East Queensland and Northern New South Wales. Qualified and experienced service technicians mean that regardless of your brand of air compressor, Enerquip can service and maintain your compressed air equipment to the highest standards. The exposure and experience gained from working on so many different brands and models of equipment enables Enerquip service technicians to see the big picture. They can easily identify problems based on experience, and implement tried and tested solutions to keep your equipment safe and productive. Although Enerquip are not “authorised” service agents for some of the following brands, many clients continue to choose Enerquip as their preferred service provider for “TRUSTED INDUSTRIAL COMPRESSED AIR SOLUTIONS”. Enerquip clients enjoy the full support of a dedicated service team who provide individualised service arrangements to suit each customer and site. Enerquip’s forecasted service planning, equipment monitoring capabilities, and just in time (JIT) maintenance ensures your equipment remains in top operating condition. The service reports completed by Enerquip are the most comprehensive you will find in the industry. Enerquip’s technological initiatives such as Toughbooks taken to site mean that reporting is completed simultaneously; so you will have full access to complete and accurate servicing records, and know exactly what has been done. In addition to this, Enerquip can service your air compressor systems onsite with their fleet of fully equipped service vehicles. 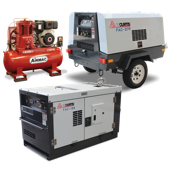 If lost production is a concern, Enerquip can provide, transport, and set up a portable diesel compressor to provide you with air while your air compressor is being serviced. 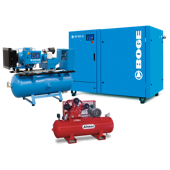 Mediocre compressor service providers will recommend you service your machinery at extended service intervals, and will only replace oil (in screw compressors) from 2000 operating hours. Truly horrific service providers will tell you to service your machinery and change your oil even more infrequently. And, as you might expect, clients of these service providers will shortly find themselves in the market for a new air compressor due to premature bearing wear and failures. For every 5ºC your air compressor operates above 75ºC degrees, the life of the compressor lubricant is cut in half. And with the hot weather we often experience in Queensland (and New South Wales), it is not uncommon for machinery to run hot for long periods of time. 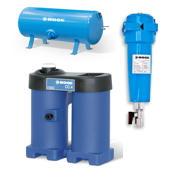 Additionally, filters and parts can become contaminated and the air compressor begins to show symptoms like: Overheating High power use High duty cycles Oil leakage Oil carbonisation Over time, this infrequent compressor service will result in some or many of these complications, more than likely costing you extra time, money, and even worse, loss of production. For these reasons, program maintenance and a strict service regime is important. Enerquip clients benefit from programmed industry best service practices, which provide year round peace of mind. Only servicing conducted by experienced and trade-qualified professionals will ensure your air compressor’s longevity and continued efficiency. An Enerquip-trained service technician will be able to prevent issues that the untrained and inexperienced can not foresee.